Bloomberg press reports a recently spotted dramatic shift in polar bears' diet. 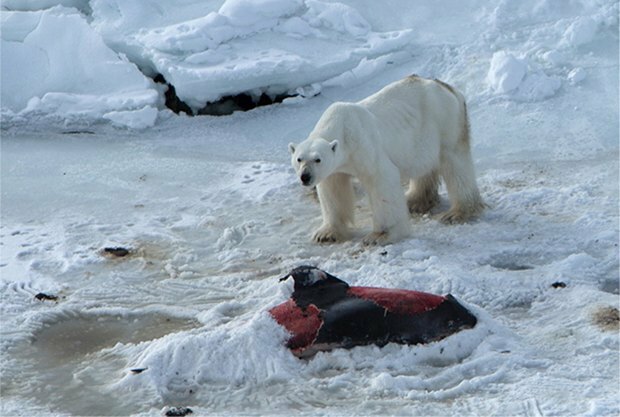 Photo evidence, coming from the Svalbard archipelago in the Norwegian Arctic, shows bears, feasting on a body of a freshly killed dolphin. As it appears, dolphins were fished out of the layer of newly formed ice. Scientists of Norwegian Polar Institute link this sudden change in the polar bears' regimen to global warming, shifting both species natural migration courses. All the involved bears appeared starved and weakened. Researchers see this incident as a further proof of polar animals not being able to adequately adapt to climate change.